Of course, I can't do anything without our lovely Wightcat own brand Parchment paper so I guess I should mention that first, at 140gsm it is great to work with, I use it in all my classes as well and at half the price of well known brands, I'm sure you will like it too. .....another one of my really can't do 'withouts' (is that a word?) is my Parchment Protector, of course you could just use a piece of kitchen paper but apart from keeping any marks off my parchment as I work, it also keeps it nice and flat and stops it getting any dents, it also has a nice semi circle taken out of it and when I'm perforating I keep it over where I'm working and it holds my work beautifully so I can get the tools 'in and out' easily. You can just about see it in the picture. 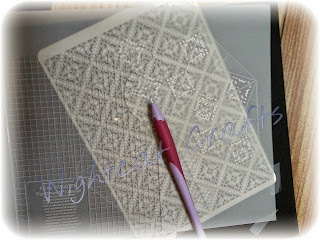 Whilst I'm talking about my Parchment Protector, have you seen the new templates from PCA. Some Wedding ones and some for men's cards, they are lovely and so easy to use. When i am parching I can't do without my perga cutters and the one thing that I use every time I make a card is my eazi score board.